Investor euphoria led the US equity market to a largely uninterrupted 12% rise in the six months to the end of April 2017. If we trace back to the lows of just over a year ago, the index has appreciated by more than 33%, including dividends. These moves have been powered by the significant outperformance of cyclical, generally lower quality companies. Having insufficient beta exposure and cyclicality has been a painful experience during this period. The reasons for this sudden and violent rotation to lower quality cyclicality at a rather unusual time in the business cycle are well documented. They include the previous positioning of the market, an acceleration of leading indicators, and positive economic surprises. These factors were turbocharged by the anticipation of massive tax windfalls and fiscal spending following the election of Donald Trump into the White House in November. Whilst it is hard to assess what the Trump administration will be able to achieve, given the unconventional approach it has been taking on many issues in its first 100 days, one should not underestimate the determination of the GOP to get something meaningful done over the next year to 18 months – for this will most probably be their window of opportunity before half term elections constrict their ability to undertake substantial reform. So is investor optimism justified? And what is now priced in to the market? Indeed, the current bull market is the second longest in history, with a total $ return from global equities of approximately 230% since the trough in early 2009. What are the implications for future returns for investors? It is time to take stock and try to answer these questions. 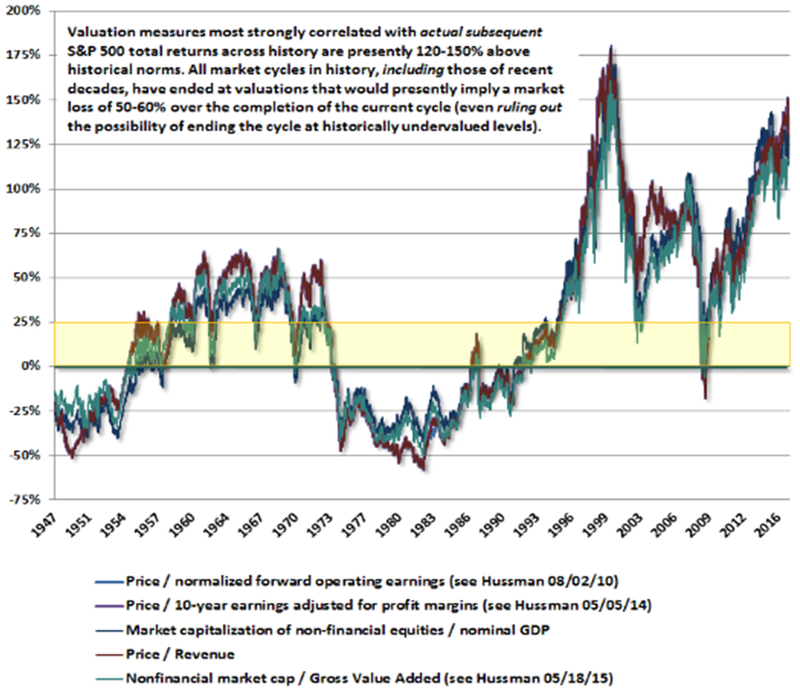 The below chart showing several valuation metrics of the S&P 500 Index is taken from John P. Hussman, who, over the last 30 years has done very comprehensive work on market valuations and their implications for future returns. This is not to say that he, nor anybody else for that matter, can predict where stocks will trade in 6 or 12 months’ time, but the accuracy of longer term projections (particularly 10-12 year forward annualised returns) has been highly accurate. Chart 1 shows that since 1947 US equity valuations have only once been more expensive than they are today – that was during the 2000 technology bubble. But there were also many companies at the peak of this bubble that could have been bought at reasonable valuations (tobacco, HPC, ‘old economy’ companies, etc.). 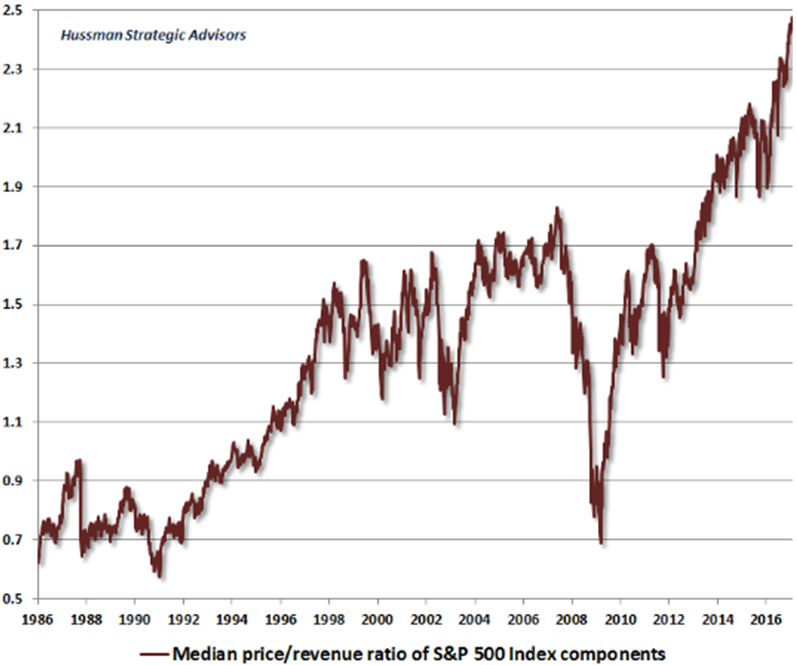 If one looks at the median price to revenue of the S&P 500 Index, shown in Chart 2 below, then current valuations are 50% above those seen in 2000 and 35% above peak valuations in early 2008, just before the Global Financial Crisis. Moreover, ultra-easy monetary policy since the GFC has caused valuations to become similarly extended across most asset classes. In other words, there is no place to hide. What does this mean for future returns from equities? As Chart 3 below shows, in previous instances when valuations were similar to what they are today, the 10-12 year forward annualised return was about 1% in nominal terms. Adjusted for inflation, real returns would tend to be negative over these periods. Timing, of course, is very difficult, using long term metrics such as these. Stocks could continue to rise strongly – perhaps for a year – before the cycle comes to an end. And one of the paradoxes of the institutional investment industry is that, whilst running long-term assets, we are measured over a seemingly shrinking time scale. But for anybody with a time horizon longer than a few months, questions must be raised as to how much risk it is desirable to employ at this stage. 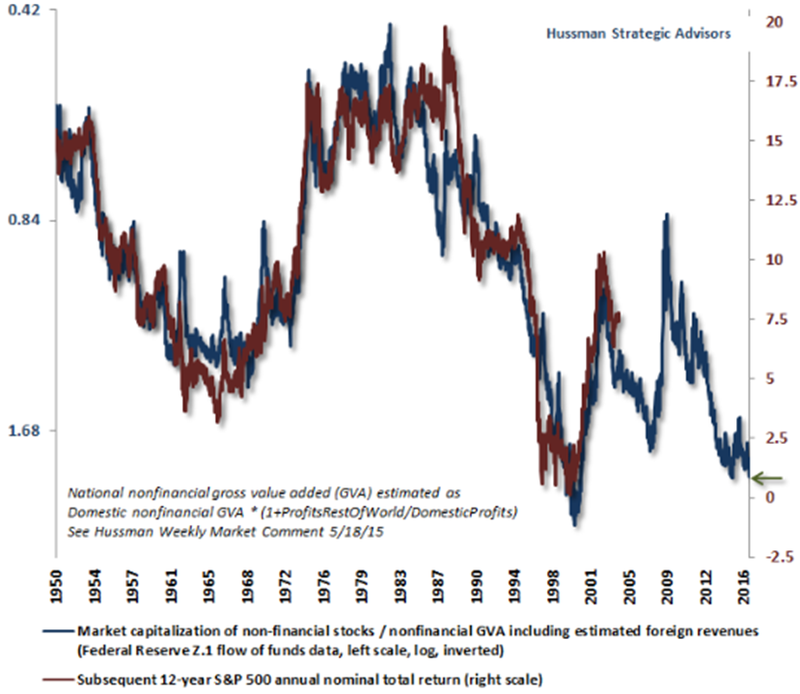 Given the market’s focus on shorter term returns, Chart 4 shows the total real return of the S&P 500 over an 18 month period for different valuation levels since 1947. The green vertical line shows today’s US market valuation. The alarming news is that, over this 70 year period, when valuations were equal to or higher than the current level, there is no incidence in which the market delivered a positive real return over the subsequent 18 months. Is it different this time? And can the new president and the rapidly changing world order achieve things that will fly in the face of this data set? Well that is possible, but it is at best a brave bet, and at worst a foolhardy strategy, in the face of data that indicate low probabilities of such an outcome. Certainly we would concede that most markets are not as expensive as the US is right now. However, with an exceptionally high correlation between the US and other equity markets, it is highly unlikely that a downdraught in the US could be avoided elsewhere. Of course, our Global Equity mandates seek relative returns and we have to be substantially invested at all times. In a low return environment, however, this can be partly mitigated through a highly disciplined approach. We believe that such an approach will pay patient investors handsomely, even though it will require a strong nerve not to chase the plethora of short term ‘stories’ that the herd will be following. As mentioned earlier, it is impossible to confidently predict when a bull market will end or when a more meaningful setback could occur, but the data we have considered so far suggests a risk averse approach. Even if equity markets make further progress, one has to assume lots of asymmetric risks in order to fully capture the upside from here. The consistent and disciplined strategy team around Francois Trahan at Cornerstone are warning of an imminent cooling of leading economic indicators on the back of multiple tightening steps by central banks, rising oil and commodity prices, stricter lending standards, tightening money supply, the Chinese leadership, etc. As is demonstrated by recent new lows in the VIX, the market has become complacent. It is now expecting a sustained upturn that does not allow for negative economic surprises. 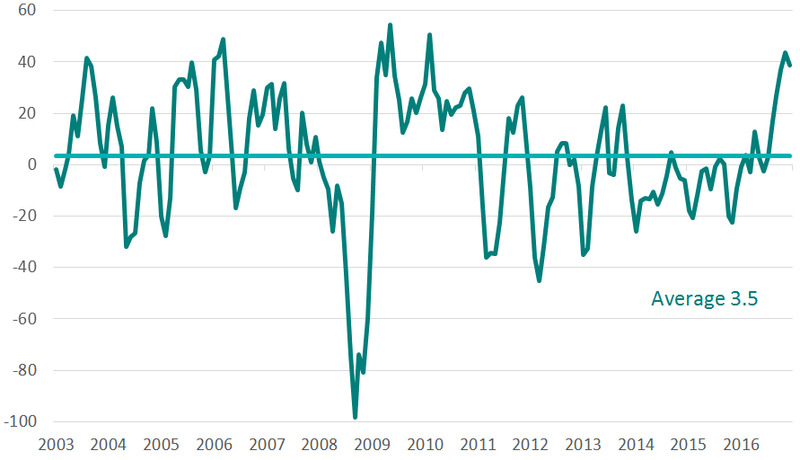 However, as can be seen in Chart 6 below, global economic surprises have recently been in extreme positive territory. In fact, they are currently in the 95th percentile of observations over the last 15 years. It will be hard to generate positive surprises from here in the short to medium term. We believe that this is not a time to increase risk in portfolios if one has a time horizon that is beyond a few months or quarters. Momentum has been driving the market higher but once this momentum turns, valuation and quality will once again become very important. In previous cycles it was always possible to identify assets or sectors of the equity market that still demonstrated some long term upside potential. Today however, after years of extremely low interest rates that have driven valuations ever higher, all asset classes appear to show very limited upside potential over the long term. The best that can be said for equities is that – on a relative basis versus bonds – they are historically cheap – although much of this is simply down to the fact that bond valuations are in unchartered territory. Due to the country’s inflationary past, this can be shown to the extreme using data comparing UK bond yields relative to the yield on equities. We believe that investing in high-quality companies generates superior long term returns. This argument should be even more compelling when the risk-reward for equities looks stretched in absolute terms. But it is also clear to us that quality means different things to different investors and is therefore less well defined than styles such as value, growth and momentum investing. As such we would think of quality investing more of an attitude or philosophy rather than a style. At this point it makes sense to set out our definition of quality companies. We are looking for businesses with clear competitive advantages such as strong intellectual property, brands and their associated pricing power, and very strong market positions through scale, network effects, or switching costs. We believe that these factors lead to superior pricing power and higher returns on capital – well in excess of the company’s cost of capital – as well as strong free cash flows. We expect these cash flows to be reinvested in order to grow the business and to enhance the existing competitive advantage. We also expect surplus cash to be returned to shareholders via dividends and share buybacks. This is where the quality of management and their incentivisation becomes important. In our view the main task of a management team, apart from running operations smoothly and safely, is to make prudent capital allocation decisions and to ensure that a strong balance sheet is maintained. When excellent management is combined with the ability to keep competition at bay (due to factors such as brand strength, high barriers to entry, economies of scale, network effects, or high switching costs) then we have the ingredients for a company whose superior returns can be maintained for longer than the market believes. In our pre-selection of stocks to consider for inclusion in the portfolio we are looking for companies with at least 10 to 15 consecutive years of double digit cash flow return on investment. 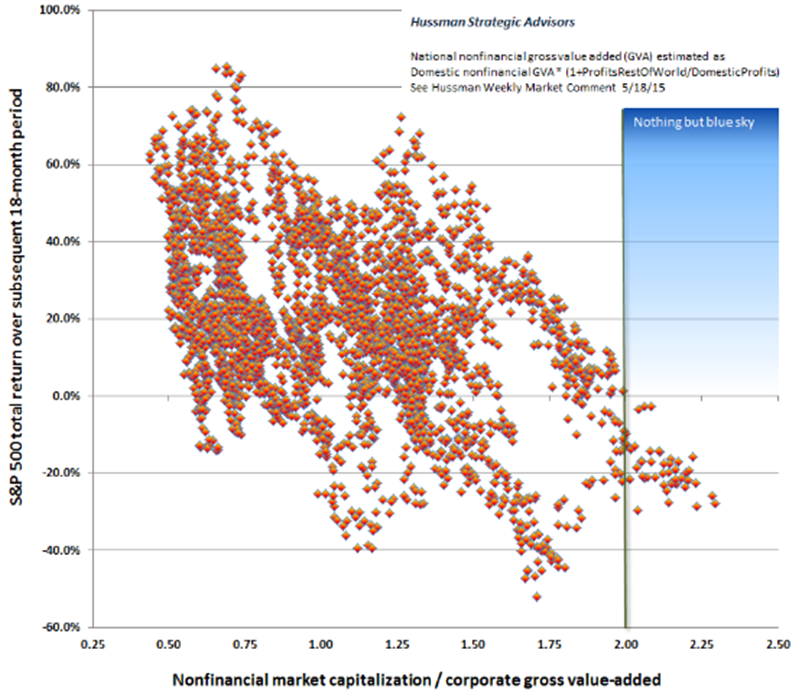 This helps us to objectively identify those rare companies that have found a valuable formula for sustainably superior returns. We then undertake detailed fundamental analysis to gauge the extent to which these superior returns and the conditions that support them can be maintained into the future. In conclusion, equity investors have benefited from the unusual length of a bull market that started in early 2009. This in turn was boosted by a QE supercharged bond bull market, which saw yields reach all-time lows and in some cases turn negative. 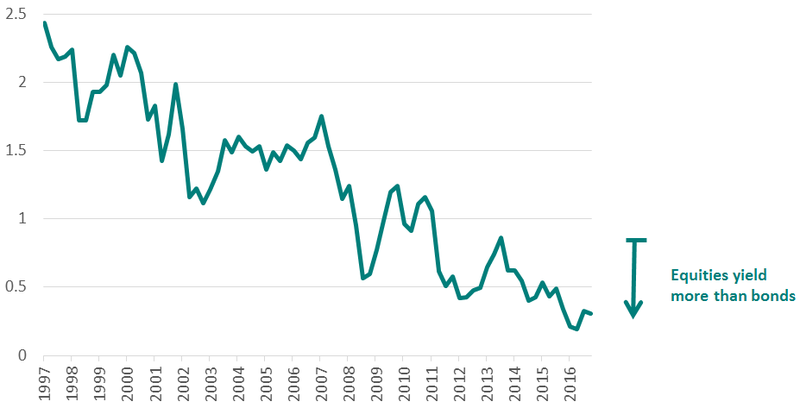 Whilst we are loath to pull the plug on a party in full swing, we are confident that equity (and for that matter bond) returns over the next eight years will be substantially more challenging than those of the past eight. Investing in such an environment requires a change of tactics from those in vogue today. We do not chase these ‘hot’ investment trends – algorithms do that. Instead we will continue to practice our longer term model of hunting down those business models that can persistently generate superior returns. If we can buy them at an attractive valuation level – usually when they are out of fashion – then we have the makings of a portfolio that can deliver strong relative returns for long term investors.